Since 2006, horse slaughter has been essentially banned in the United States, due to Congressional refusal to fund USDA inspections of horses at United States Slaughter Houses. It is sad to say that on November 18th, this ban was silently lifted when Congress passed, and President Obama signed into law, a USDA spending bill that reinstated federal funding for inspection of horse meat intended for human consumption- effectively lifting the ban on domestic horse slaughter. The lifting of the ban was the direct result of a Congressional Subcommittee Report “Horse Welfare: Action Needed to Address Unintended Consequences from Cessation of Domestic Slaughter” which connected the 2006 slaughter ban to an increase in neglect and abandonment of horses, as well as a drop in the price for horses. According to the report, the 2006 ban also resulted in a dramatic increase of horses being shipped to both Canada and Mexico for slaughter, with 138,000 horses having been shipped for slaughter in 2010 alone. 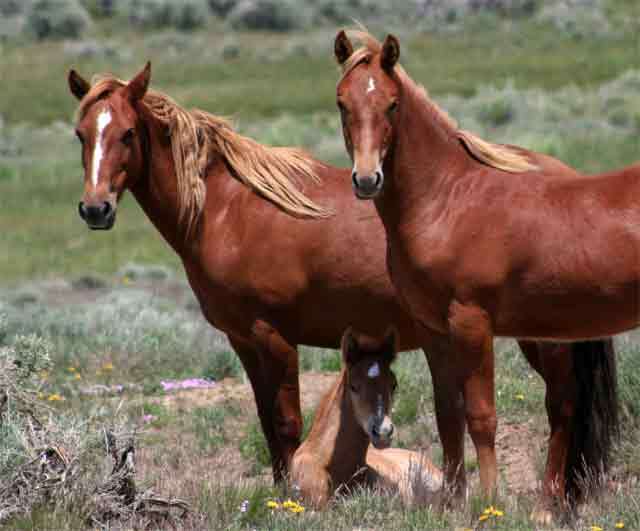 Animal welfare organizations such as the Humane Society of the United States argue that allowing domestic horse slaughter is not the proper tool for these managing issues, and instead posit that the move is a waste of taxpayer dollars. Their arguments ring true when reports show that 70% of polled Americans are opposed to horse slaughter. President Obama, who made a campaign statement that he would support legislation to institute a permanent ban on horse slaughter and exports of horses for human consumption, may have some explaining to do to animal welfare organizations that have protested his actions. Obama did not keep any of the promises he made. He told people what they wanted to hear so he would get elected. The horses are just collateral damage in an ever-increasing lust for meat! We should now expect horse farms where horses are raised for human consumption just like other farm animals. What a national disgrace! Mr. Obama, I’m appalled at your involvement in this horrifc act of cruelty to animals. How can you as a father explain this to your daughters. Anybody with even a small familiarity with the equestrian or veterinary communities knows well that, despite the supposed best of intentions, the ban on domestic slaughter led to untold suffering by horses across the country. Hal 9000, you are correct, I wish more people realized that. Many so called Horse rescues have been charged with neglect when do gooders try to “rescue” them all and then can no longer afford to feed/care for them. Responsibility must come from each and every horse owner. Over breeding continues to be a problem with backyard breeders trying to make a fast buck. I wish we had more of the European standards for breeding horses here. Stallions and mares have to pass conformation/temperment and performance standards before they are eligible for breeding and full registration. So horses will be treated like cows, pigs, goats, etc. It makes no sense to howl about lifting the ban on horse slaughter while ignoring the unmitigated torture and slaughter of these other animals. Incidentally Hal900 and Blonde Cowgirl, while you are entirely correct that horses suffer greatly with the ban in place due to overbreeding, and transport of horses to slaughterhouses in Mexico and Canada, you’re both naive if you think slaughterhouses here are humane (yeah I know, we have *standards*. riiiight.) Go visit one or two and then talk about how good it is. Let me be clear though, while I regret that this ban is lifted on the one hand, I think it is hypocritical to oppose horse slaughter while continuing to eat factory farmed meat from other tortured animals. I don’t like mega-scale “factory” agriculture for numerous reasons. Only a few include the inhumane treatment of animals, exploitation of workers (often illegal immigrants), marginalization of small, family-run farms and ranches, and the ill effects on public health and the environment. As for slaughtering, I’m hardly naive. I’ve hunted and been around animal husbandry my entire life. There’s no “pretty” way to kill something. Still, death in a slaughterhouse is far better than the slow, agonizing wasting away many of these horses might otherwise face. And as for wild (actually, non-native, feral) horses — well, there are no retirement homes or pleasant ways to die in nature. Those which get dragged down by a predator are the lucky ones in that regard. Cowgirl, I agree with you that in the long run, deep and sweeping reform is needed. Over-breeding continually just makes things worse for horses everywhere. So now these bastards will over-breed horses specifically so they can slaughter them for their meat and I can’t believe some people think it will be actually good for the horses! It speaks volumes for a nation that trades animals like commodities on the stock market. And Americans can rejoice that now in addition to cheap steak and chicken nuggets, you will get to eat cheap horse meat. What a fucked up nation. Its decline cannot be prevented. Hal900, we could opine all day about whether death in a slaughterhouse is preferable to death by predator (which is, at least some of the time, faster, and not preceded by long, painful and terrifying transport). I do know that an animal’s chance of surviving a predator at least a couple times in his/her life is a lot greater than surviving a slaughterhouse… I’ve been around hunting too (grew up with it). It is a far cry from slaughterhouses. In the end slaughterhouses (for all farmed animals) as well as “factory” farms are only regulated insofar as the profit margin remains intact. You should know that meat prices would go through the roof if there were ever any meaningful “humane” regulation of the industry. By and large, animals have no good options to avoid suffering as death comes. Even those wild creatures who manage to evade predators face a long, excruciating decline after their teeth wear down to the point they can no longer effectively eat. At that point, it’s disease, freezing or starvation — pick your poison, so to speak. We all imagine a world according to our ideals. I don’t want any creature to suffer needless pain or terror. You don’t, and most people do not. In your ideal world, nobody would eat meat at all. In mine, nobody would eat meat unless they hunted it or raised and slaughtered it themselves. But we, and horses, don’t live in a world of ideals. The facts stand. The slaughter ban caused vastly more equine suffering than it supposedly prevented. We can mull the details and implications of what happens now. But regardless of our thoughts and pontifications, the slaughter ban was ill-concived and pragmatically indefensible. Hence, it was reversed. And good riddance. If the American population was to develop an appetite for horse meat, it would have done so long before now. And it most certainly will not because the ban was lifted. Just as Americans don’t like to eat dogs — as some cultures do — I seriously doubt they are suddenly going to develop a craving for equine steaks, burgers and nuggets. Much of the horse meat might go into pet food. That which is sold for human consumption, will go to other nations. And that being said, this isn’t about producing more horse meat. It’s about alleviating the problems, and animal suffering, that equestrians, vets, wild horse management agents and numerous others correctly predicted would directly result from the slaughterhouse ban. Perhaps you should quit assuming the worst possible motives and wretched evil in others, and take the time to visit with some experts in the fields of equine sciences and horse care. What BS. There is no data to back up the so-called abused and neglected animals Congress is talkng about, and they admit they don’t have it. It’s probably fabricated because until recently, nobody bothnered to follow up or questioned things. The hundreds of thousands of horses per year expected to be slaughtered do not consist of the neglected animals. When there’s money to be made, anything goes. If you truly cannot take care of an animal anymore, there are more humane methods than sending them to the slaughterhouse. As far as dying in the wild, it’s nature’s way and nature’s way is always best. Every time mankind inteferes in nature, they mess things up terribly. I don’t eat red meat – but those animals are raised for that, horses are not. I don’t think it’s a realistic goal to expect everyone be vegetarian, but humane raising and handling of animals is, and being responsible for your horses certainly. How can, in the so-called ‘civilized West’ – smaller European countries (not to mention larger ones…) be expected to ban horse-meat consumption when a ‘giant’ like the US condones it? It is the owners who should be fined and sentenced, not the neglected horse for being born a horse and at the owner’s mercy. The US are neither China or any other Asian country, let alone South America and their ignorant ways. Obama? I’ve gone completely off him. Oblaba is more to the point. Pardon me. The move is a DISGRACE. — Yours truly: a European. or NO MORE THAN 1 BORN A YEAR. NEIGHBORS TURN YOUR NEIGHBORS IN TO THE LAW. $$ FINE THESE PEOPLE ALOT MORE THAN THEY WOULD BE MAKING BY BREEDING HORSES NOT FOR BETTERING THE BLOODLINES. HORSES THAT ARE NOT GREAT REGISTERED HORSES OR GREAT RIDING HORSES ARE DOOMED FOR THE SLAUGHTERHOUSE. BECAUSE THEY ARE MUTTS, THEY ARE WORTH NOTHING, ULESS SOMEONE SPENDS HOURS WITH THEM MAKING THEM WORTH MONEY. WHY IN THE HELL WOULD YOU BREED FOR THIS, UNLESS YOU ARE BREEDING FOR SLAUGHTERHOUSE INCOME. SO…..PEOPLE TAKE CONTROL …..DO SOMETHING DON’T JUST TURN YOU FACE SO YOU WILL NOT SEE.!!!!!!!!!!!!!!!!!!!PLEASE!!!!!! TO BEGIN WITH. I ASSUME YOU MADE THAT CHOICE. DEGREE TEMPERATURES, ALL ACROSS THIS COUNTRY…HAVE A ROD DROVE THROUGH IT’S HEAD AND THEN BE PACKAGED AND SOLD SO SOMEONE CAN MAKE THE ALMIGHTY DOLLAR $$$$$$$$$. GREED, IT WILL COME BACK ON YOU! !